I had a Sharp unit that finally gave out and when searching Amazon I found this new DeLonghi air conditioner with eco-friendly refrigerant. I have always liked DeLonghi products for their stylish looks and this air conditioner is no execption. I have a metal roof with vaulted ceilings and when it gets hot the upstairs loft gets about 10* hotter than the rest of the house and since this is where I sleep I need some extra comfort. We turn it on around dinner time and put it in the turbo function that uses both water and air cooling to bring the temperature down and then when we get ready for bed we turn it down to the sleep function which is pretty quite for an air conditioner. I like the easy to read LCD display and the super cooling with the water tank really helps get the room temperature down quickly. This is a solid unit that weighs about 130 pounds so the casters and built in handles help in moving it around. 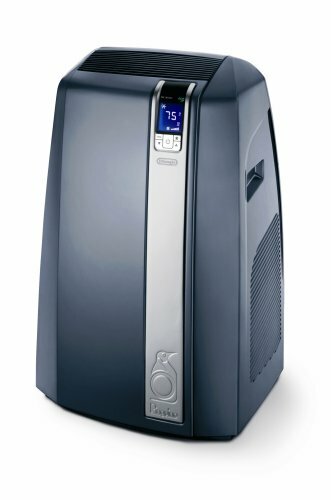 It has all the bells and whistles with 24 hour timer, auto/sleep function, turbo cooling and even dehumidifies. The R410a eco-friendly gas refrigerant was a bonus as I try to do my part to help the enviornment. VERY Noisy. Have fun refilling this unit with water to get 13000 BTU. I admit, I got suckered into buying this unit because of the marketing and slick featureset. What a disappointment. I am returning it as quickly as possible, and would probably avoid Delonghi products going forward. I was trying to get information on where to buy replacement filters from Delonghi USA (& Canada), the former did not reply to several emails (USA tech support), and the latter - the Canadian support email bounced (no such mailbox). What a joke. Really nice & modern color scheme, graphite and silver. Pretty blue LCD that displays everything you need to know. VERY Noisy - sounds like an old dishwasher when cooling in Water to Air mode (swishing noise, I am guessing the rotary engine cooling off using the water). Water refilling to get optimal cooling (to get 13K BTU) is annoying & frequent (Tested on a very hot day I had to refill it every 6 hours), I would bet that most people would give up on this eventually. Without the water, this unit does 9000 BTU in air cooling. Huge - This thing is only portable due to the casters. Very bulky. No Oscillating Louvers! The air is blown up in one direction, no choice. No information on how (part#?) or where to buy the 3M filters that should be replaced once a year. Heavy - Perhaps I'm being picky here, but this thing is so heavy (128 lbs). What I recommend instead: The Sharp CVP10MX, as most people here (Amazon) have had a great experience with it. I recommend you have a look.